Join us for a discussion of our newest Brodsky Gallery show, with poet Bernadette Mayer and show curator, Emily Rush (C’19). Bernadette Mayer is a synesthete who sees letters in color. For this Brodsky Gallery show, Emily Rush (C’19) produced a Pantone alphabet key, matching Mayer’s synesthetic vision as closely as possible, and then re-typed a series of Mayer’s poems. The show features art by Alyson del Pino (C ’21), Autumn Wynde (C ’19), Kayla Ephros, Laynie Browne, and more. Brian Teare is the author of five critically acclaimed books, most recently Companion Grasses, which was a finalist for the Kingsley Tufts Award, and The Empty Form Goes All the Way to Heaven. His sixth book, Doomstead Days, will be out from Nightboat Books in 2019. 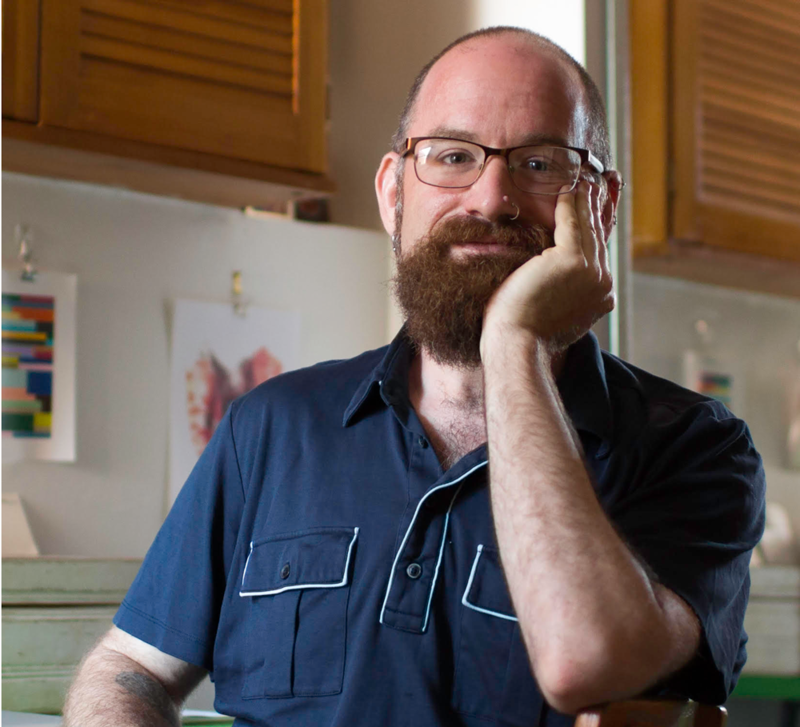 His honors include a Lambda Literary Award and fellowships from the NEA, the Pew Foundation, the American Antiquarian Society, and the MacDowell Colony. An Associate Professor at Temple University, he lives in South Philadelphia, where he makes books by hand for his micropress, Albion Books. 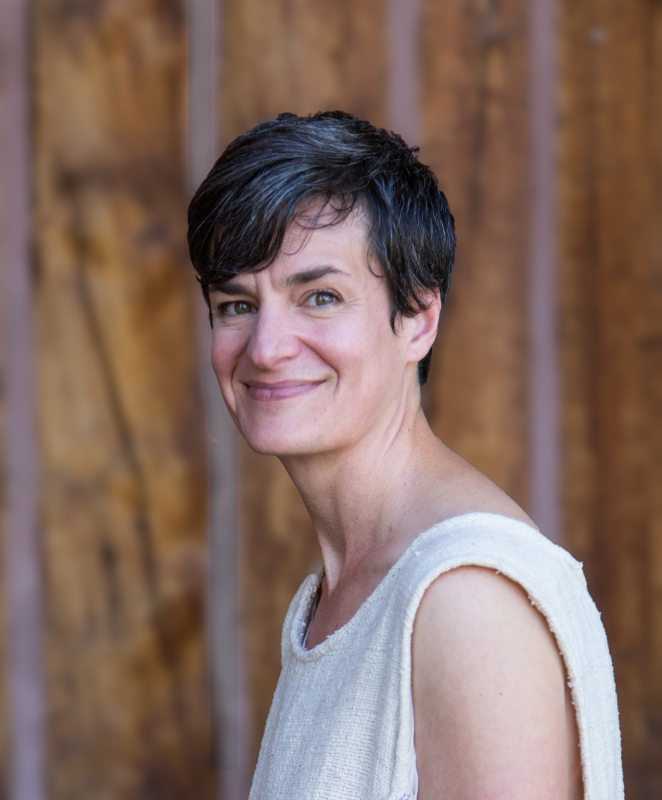 Allison Cobb is the author of After We All Died (Ahsahta Press); Plastic: an autobiography (Essay Press EP series); Born2 (Chax Press); and Green-Wood, originally published by Factory School with a new edition in 2018 from Nightboat Books. Cobb’s work combines historical and scientific research, essay, and poetry to address issues of landscape, politics, and ecology. She was a 2018 finalist for the Oregon Book Award; a 2015 finalist for the National Poetry Series; a 2015 Djerassi Resident Artist; a 2014 Playa Resident Artist; received a 2011 Individual Artist Fellowship award from the Oregon Arts Commission; and was a 2009 New York Foundation for the Arts Fellow. Cobb works for the Environmental Defense Fund and lives in Portland, Oregon, where she co-hosts The Switch reading, art, and performance series. “Stand-Ups Sit Down” is an annual series that features stand-up comedians in conversation with eminent TV comedy writer (and Penn alumnus) Lew Schneider. Judy Gold is a stand-up comedian, actress, television writer, and producer. 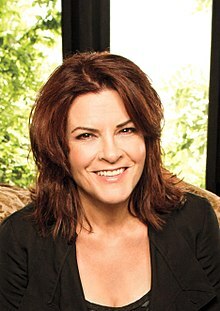 She won two Daytime Emmy Awards for her work as a writer and producer on The Rosie O’Donnell Show and has had stand-up specials on HBO, Comedy Central and LOGO. She has written and starred in two critically acclaimed, Off-Broadway hit shows: The Judy Show – My Life as a Sitcom (Outer Critics Circle Nomination), and 25 Questions for a Jewish Mother (GLAAD Media Award – Outstanding NY Theater, Drama Desk Nomination – Actor).Gold received rave reviews as Gremio in The Public Theater’s all female production of The Taming of The Shrew for Shakespeare in the Park. She also co-starred in Off-Broadway’s Clinton! The Musical, and Disaster! The Musical. Gold is a regular on Comedy Central’s new series This Week At The Comedy Cellar. She has also appeared on The Late Show with Stephen Colbert. She as been seen on the reboot of Murphy Brown, has recurring roles on Netflix’s Friends From College and TBS’ Search Party and was on the Showtime series I’m Dying Up Here. She was featured in Woody Allen’s series Crisis In Six Scenes on Amazon, and also appears on the hit web-series The Other F Word on Amazon Prime. Other most recent TV appearances include guest-starring roles on Broad City, Louie, The Unbreakable Kimmy Schmidt, The Jim Gaffigan Show, Inside Amy Schumer, Difficult People, 30 Rock, and 2 Broke Girls. From 1999-2010, Judy was the host of HBO’s At The Multiplex With Judy Gold. She has written for The New York Times, Huffington Post, CNN.com. She is also a talking head on MSNBC as well as CNN. She is the host of the hit podcast, Kill Me Now, on iTunes. You can find her at JudyGold.com or follow her on twitter & Instagram – @jewdygold. Laurie Kilmartin is a stand up comedian, late night writer and New York Times bestselling author. Laurie has performed standup on CONAN, Jimmy Kimmel Live and numerous shows on Comedy Central. Her Seeso special, 45 Jokes About My Dead Dad, made Vulture’s Top Ten Comedy Specials of 2016, as well as Paste, Splitsider, Interrobang and The Decider. The New York Times pointed to, "sharply written one-liners captured the pain and frustration of caring for a dying loved one." Paste Magazine called it "hilarious... brutal, and cathartic" and Interrobang called it "innovative... twisted and dark.“ Before joining the writing staff at CONAN (2009 to present), Laurie was a staff writer on The Late Late Show with Craig Ferguson, Too Late with Adam Carolla and Tough Crown with Colin Quinn. In 2012, Laurie wrote the New York Times bestseller Sh*tty Mom, a parenting book that Time Magazine called “criminally funny.” Laurie has performed at the Edinburgh, Montreal, Bridgetown and Moontower comedy festivals. She's also done shows for the troops in Iraq, Qatar, Kuwait and Diego Garcia. Her podcast with comedian Jackie Kashian, The Jackie and Laurie Show, is big with young comedians and middle aged men. Laurie lives in New York and LA. 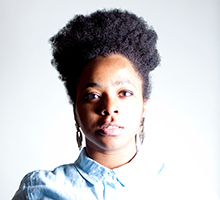 Kai Davis is a writer, performer and teaching artist from Philadelphia. In 2016 she received her Bachelors in African American Studies and English. 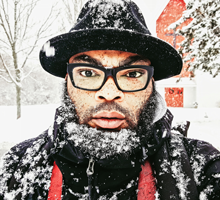 Between 2012 and 2016 Kai Davis was the Artistic Director of The Babel Poetry Collective. She has performed for TEDX Philly, CNN, BET, PBS, and NPR, among others. She is a two time international grand slam champion, winning Brave New Voices in 2011 and The College Union Poetry Slam Invitational in 2016. She is a 2017 Leeway Transformation Award Recipient. Right now she spends most of her time working as Poetry Editor for Apiary Magazine and as an Organizer/Artistic Director for The Philly Pigeon. She also visits high schools and local non profit organizations, teaching poetry to marginalized and under-served young folk. When she is not in Philly, she tours colleges and universities across the country, performing her original work and facilitating writing workshops. As a Queer Woman of Color, much of her work deals with the topics of race, gender, power, sexuality and its many layers. She aims to explore how it affects who we are, who we will become, and how we love. Mecca Jamilah Sullivan is an Assistant Professor of English at Bryn Mawr College. She holds a Ph.D. in English from the University of Pennsylvania, an M.A. in English and Creative Writing from Temple University, and a B.A. in Afro-American Studies from Smith College. A proud native of Harlem, NY, her critical and scholarly work on sexuality, identity, and poetics in contemporary African Diaspora culture has appeared in Palimpsest: Journal of Women, Gender and the Black International, Jacket2, Public Books, GLQ: Lesbian and Gay Studies Quarterly, Ebony.com, Ms. Magazine, and The Feminist Wire, where she served as Associate Editor for Arts & Culture. She is also the author of the short story collection, Blue Talk and Love (Riverdale Ave 2015), a finalist for the Lambda Literary Award for fiction. In her fiction, she explores the intellectual, emotional, and bodily lives of young black women, through voice, music, and hip-hop inflected magical realist techniques. Her short stories have appeared or are forthcoming in Best New Writing, American Fiction: Best New Stories by Emerging Writers, Prairie Schooner, Callaloo, Crab Orchard Review, Baobab: South African Journal of New Writing and many others. She is the winner of the Charles Johnson Fiction Award, the James Baldwin Memorial Playwriting Award, and fellowships, scholarships and residencies from the National Endowment for the Arts, the Bread Loaf Writers’ Conference, The Yaddo Colony, the Hedgebrook Writers’ Retreat, and the Center for Fiction in New York City. Join us for a sneak peak at plays selected for the Alternative Theatre Festival (ATF), an annual celebration of experimental plays written by Penn playwrights, hosted by Penn’s undergrad-led experimental theatre group iNtuitons. 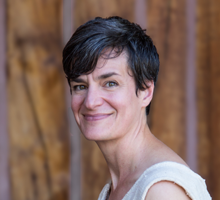 Katie Degentesh's first book, The Anger Scale (Combo, 2006), was featured in the Poetry Society of America’s New American Poets Series. Her work has been reviewed or featured in venues such as The Believer, the Chicago Review and Postmodern American Poetry: A Norton Anthology. She lives in New York City, where she works as a digital creative director and brand consultant. Curated and hosted by Simone White, BREAKING THROUGH features poets on the verge of publishing their first books for conversations about poetics, influence, and the future of poetry. A. H. Jerriod Avant is from Longtown, Mississippi. A graduate of Jackson State University, he’s earned MFA degrees from Spalding University and New York University. He’s received scholarships from the Breadloaf Writer’s Conference and Naropa University’s Summer Writing Program. 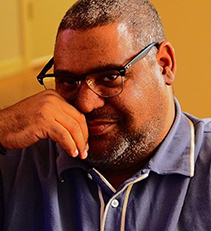 His poems have appeared in Mississippi Review, Callaloo, Ecotone, Boston Review, Virginia Quarterly Review & other journals. A recipient of two Winter Fellowships from the Fine Arts Work Center in Provincetown, Jerriod is currently a PhD English student and teaching assistant at the University of Rhode Island. Adjua Gargi Nzinga Greaves (New Yorker, b. 1980) is a Pushcart-nominated poet concerned with postcolonial ethnobotany, the limits of language, and archive as medium. Greaves has most recently been published in the collections Letters to the Future: Black Women / Radical Writing (Kore Press, 2018), and Creature/Verdure (Pinsapo Journal : Issue 2, 2018), as well as in her chapbook Close Reading As Forestry (Belladonna*, 2017). JOY UDE Joy O. Ude is a mixed-media artist and designer. In her artwork, she explores Black culture as a subset of American culture. As an American-born child of Nigerian immigrants, she also reflects on the concept of duality. Ude earned her BFA in Fashion Design from the University of North Texas, and an MFA in Fiber Arts from the University of North. 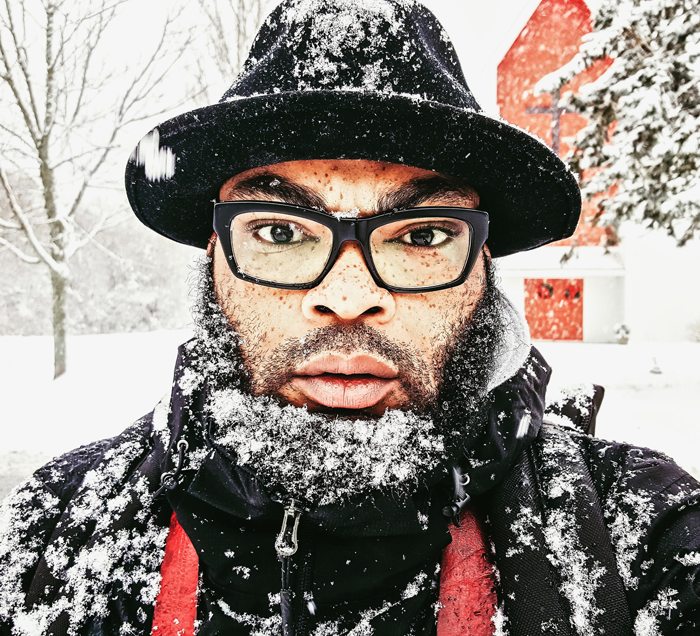 Ude is currently STEAM Educator at Independence Seaport Museum, Adjunct Instructor at Tyler School of Art, and a member of Philadelphia’s FJORD Gallery. Find more at https://joyoftextiles.com . NATIONALITIES SERVICE CENTER Each year, NSC helps over 5,000 refugees and immigrants start new lives in the United States. Nationalities Service Center is a nonsectarian organization that serves clients regardless of gender, race, religion, or legal status. In a holistic approach to service, they host Wellness Wednesdays, which includes an hour of knitting. In many cases, the stitches are the only common language spoken. Find more at https://nscphila.org/. SHELBY DONNELLY Shelby Donnelly is an interdisciplinary visual artist and educator who makes screen printed and sewn textiles, garments, and objects that are contextualized within videos and installations. Her work stages dramas that come from observing humanity's relationship with ritual, ceremony, and spirituality and how that plays out in everyday existence. Donnelly was the 2014 recipient of the Independence Foundation Artist Fellowship and traveled to Morocco to co-curate an exhibition at TALIM. She holds a B.F.A in Printmaking and Drawing from Washington University in St. Louis and a M.F.A in Material Studies from Tyler School of Art. Find more at http://www.shelbydonnelly.com/ . BHUTANESE-AMERICAN ORGANIZATION - PHILADELPHIA BAO-P was established in 2013 to serve the newly resettled Bhutanese community in Philadelphia area. BAO-P is committed to empowering the Bhutanese community in Philadelphia in all aspects of development: employment, education, cultural integration and citizenship and it envisions a self-sufficient, progressive, and productive community that contributes to nation building. While Bhutanese women are known for traditional backstrap loom weaving, knitting is also a popular pastime. Find more at https://www.bao-phila.org/. BETTY LEACRAFT Betty Leacraft is a shape shifter of textiles and mixed media fiber, a visual artist, and educator. She blends multiple techniques/processes that blur lines between art quilts, wearable art, sculpture, and installation. Her work is informed by artistic/cultural traditions of Africa and the African Diaspora addressing themes of identity, heritage, symbolism, environment, and ritual. 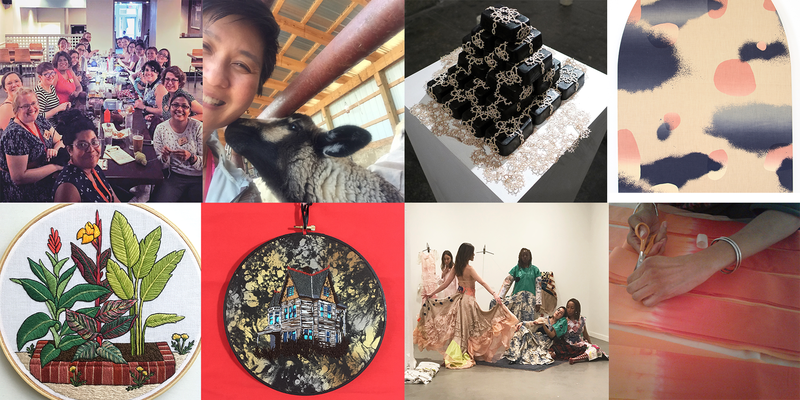 Betty has received grants, awards, honors, and exhibited internationally; as an educator, Betty creates opportunities for underserved communities and individuals through textile arts projects. Find more at http://bettyleacraft.com/. THE DRUNKEN KNITWITS A group of self-admitted knit-aholics, the Philadelphia branch of this global organization meets weekly in local bars and cafes for drinks and crafting. Founded in Oxford (UK), Drunken Knitwits also has chapters in Cambridge, Manchester, and Newbury (UK), Melbourne, Sydney, and Brisbane (Austraila), Dublin (Ireland), and Boston. The group welcomes all skill levels and all genders (21+ only, obvs). Find more at https://www. meetup.com/PhiladelphiaDrunkenKnitwits/. ASH LIMÉS CASTELLANA Ash (Ashley) Limés Castellana is a printmaker and multimedia artist. She’s the first-generation American daughter of Cuban immigrants, and was raised in the sunshine of Miami, FL. Her artistic practice seeks to promote a connection with ourselves and the natural world by creating environments using the language of architecture and geology. Ash is a Museum Education Coordinator at the Fabric Workshop and Museum; a Coordinator and Educator at Second State Press, and a Youth Educator at the Philadelphia Museum of Art. Find more at https://ashlimes.com/. Workshop students: Max Abram, Daisy Angeles, Maria Baez, Johnathan Chen, Sonali Deliwala, Devin Esch, Natalie Kahn, Delila Keravuori, Danielle Kramer, Sam Ksiaa, Becca Lambright, Julia McGurk, Anya Mushakevich, Erin O'Malley, Caroline Scown, JaHyun Yang. Richard Barone and Rob Norris, both founding members of the Bongos, join Anthony DeCurtis for an evening of discussion and performance of the songs of Lou Reed and the innumerable artists he influenced. Norris met Reed during the heyday of the Velvet Underground and later performed with a version of the band after Reed quit. Barone was a friend of Reed's during the last decades of his life and has performed his songs in many settings. DeCurtis is a distinguished lecturer on the creative writing faculty at Penn and the author of the biography, Lou Reed: A Life. Rob Norris is best known as the bassist for The Bongos — the founding fathers of the ‘80’s Hoboken NJ indie-music scene. He also plays with Blue Paradox, East Of Venus, Richard Barone & Friends, Joan Henry & Noyeh-Ongeh, Mother Earth, and Bibi Farber. 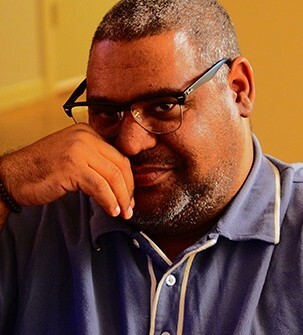 Abani is the recipient of a Guggenheim Fellowship, the PEN/Hemingway Award for Graceland, the PEN Beyond the Margins Award, the Hurston Wright Award, and a Lannan Literary Fellowship, among many honors. His work has been translated into French, Italian, Spanish, German, Swedish, Romanian, Hebrew, Macedonian, Ukrainian, Portuguese, Dutch, Bosnian, and Serbian. Aditya Bahl is the author of three chapbooks of poetry: This is Visual Poetry by Aditya Bahl (Dan Waber), Since 1988 (Delete Press), and Name Amen (Timglaset Editions). He is at work on an experimental book-length translation of a single, short poem by Muktibodh, the great Hindi modernist and Marxist. Excerpts from this project have appeared in Social Text, Datableed, and Almost Island. His visual work is being exhibited at Museo Sperimentale d’Arte Contemporanea in L’Aquila (Italy). He is enrolled in the Ph.D. program at Johns Hopkins University. Fatemeh Shams is assistant professor of modern Persian literature. In her capacity as a creative writer and poet, Fatemeh has so far published three poetry collections. Her most recent poetry collection, When They Broke Down the Door (Mage Publisher), was released in paperback in 2016 and it also received the Latifeh Yarshater’s annual book award in 2017. She was recognized as one of the leading voices of Persian poetry in exile in 2012 when she received the annual poetry award of Jaleh Esfahani in London. Her most recent poems have/will appear in various anthologies, World Literature Today and Michigan Quarterly journal. Anne Ishii is the Executive Director of Asian Arts Initiative in Philadelphia. Her writings have appeared in multiple publications including Slate, the Village Voice, and Publishers Weekly. Her translation and editorial projects include the Eisner-award winning manga My Brother's Husband by Gengoroh Tagame, Batmanga! : the Secret History of Batman in Japan, and Massive: Gay Japanese Manga and the Men Who Make It. She is co-founder of the publishing, fashion, and creative agency Massive Goods, which represents queer and feminist artists from Japan. For our first annual Bernheimer Symposium, our Program Coordinator Erin Gautsche invented for us what has become an annual tradition. Each year, the Hub selects a book to read aloud, straight through from beginning to end. We celebrate the book with extravagant decorations, food, and props all derived from the text. Want to sign up as a reader for this year’s book? Email wh@writing.upenn.edu. Sign up here. This year's Bernheimer Symposium is “Extremely Online,” a panel discussion between five comedy writers on the practice of being funny in the age of platform capitalism. The conversation will cover a wide range of topics from Facebook’s looming influence on comedy institutions to the effects of Twitter’s timeline on the voices and psyches of emerging joke writers. Using tweets, video clips, screenshots, and many personal anecdotes to parse through the current state of comedy, the panel should serve as a guiding light for aspiring satirists or anyone whose ever wondered when’s the appropriate time to log off. The event will be hosted by Ronald Metellus, and features Kyle Harris, Caitlin Kunkel, Jeremy Levick and Milly Tamarez. Milly Tamarez is a stand-up, writer, and comedic actor based out of Brooklyn, New York. She has written for the Onion Studios, Reductress, BRIC, and has been featured on Vice, BET, Above Average, Univision, and Comedy Central. She’s the founder of the satirical website Flexx Magazine. Kyle Harris is a comedian and writer originally from Boston and recently moved to Brooklyn, Kyle is a regular at Good Good Comedy Theatre where you can see him every second Sunday of the month with the sketch comedy collective Darlings. He's also performed at clubs including Punchline Philly, Helium Comedy Club, ImprovBoston and currently studies at the Upright Citizens Brigade Theatre in NYC. He most recently performed at the 2018 Cream City Comedy Festival in Milwaukee, the Altercation Comedy Festival in Austin and is a contributor to satirical site Flexx Mag. Jeremy Levick is a Brooklyn-based writer and comedian. He's currently a senior contributing writer at The Onion and a contributor at its sister site ClickHole. Caitlin Kunkel is a comedy writer and satirist who lives in Brooklyn. She created and teaches the Online Satire program for The Second City and is a co-founder of the comedy and satire site for female writers, The Belladonna. Her first satirical book, “New Erotica for Feminists,” was published last November. Ronald Metellus is a writer and performer who works as a senior contributor at The Onion. He's currently developing a web series with OpenTV and is a friend of the Writers House.